Sad news from London today as the sudden death of actor Ian Richardson was announced. Richardson was an original member of the Royal Shakespeare Company and played many of the Bard's greatest roles for that company in its early days. He tackled Hamlet at 24 and by all accounts was a memorable Richard II. I first saw Mr. Richardson when my entire family went to see a 20th-anniversary Broadway revival of My Fair Lady in 1976. I was just a kid, but remember the evening very clearly. It was a formative experience for me about the magic of theatre. We sat in the front row of the balcony, and I left convinced that Christine Andreas, who played Eliza, sang "I Could Have Danced All Night" directly to me! Richardson was courageously stepping into shoes previously worn only by the inimitable (and Tony and Oscar winner) Rex Harrison. Richardson sang more than old Rex ever did, and made the role his own. Like so many wonderful English actors, he was probably best known in America for something rather silly. He was the Grey Poupon guy in the 1980s commercials: "Pardon me, but do you have any Grey Poupon?" he said, from the rolled down window of a gorgeous luxury car. 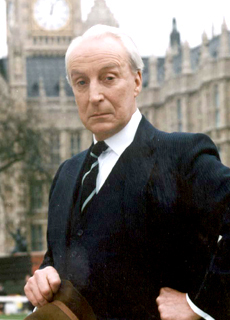 Richardson's most prominent role was probably Francis Urquhart, the Machiavellian MP in the television mini-series House of Cards. I first saw it on PBS in the early '90s, and he was fantastic playing a scheming, reptilian politician whose Shakespearean asides to audience via direct address to the camera were both chilling and hilarious. The series is riveting if you ever get the chance to see it. Urquhart's signature line, "You might think that; I couldn't possibly comment," was a brilliant way to convey agreement without leaving any fingerprints. It is a line I have used often since! By all accounts Richardson himself was quite different from his cold-hearted character. Married for many years, the Edinburgh native was the father of two and lived a quiet life in Richmond. Richardson apparently died in his sleep without any illness or warning. Terrible shock for friends and family, but definitely the way to exit this world if you have the chance. So good for him. And think of him if you find yourself spreading any mustard this weekend! As you say, definately the way to go if you get the choice. I didn't get the mustard connection, but as I couldn't get through the week without a dabble or two in the muatard jar, I'll be thinking of him. Thanks for visiting ... Grey Poupon is a fancy mustard that Mr. Richardson peddled in television commercials here in the U.S. Just a silly thought, really. I think most of us missed this one with the whole Anna Nicole Smith headlines. I often think that what is a great way to die for an individual is not so great for the ones they leave behind- no goodbye, no warning. I remember those ads. Funny that such a distinguished actor is remembered for something so silly. A bit like Guiness in Star Wars and Gielgud in Arthur, right? Really, I knew Richardson better from the House of Cards ;-). I'll say your memory from '76 is a gem. Dreamlike and, if this transition doesn't work kick me, we can imagine Richardson's curtain call was indeed peaceful and yet we 'couldn't possibly comment'. Okay, kick me. A lovely commemoration, C.
Aw,if you hadn't said it I would have (he did pass in a way that is merciful).